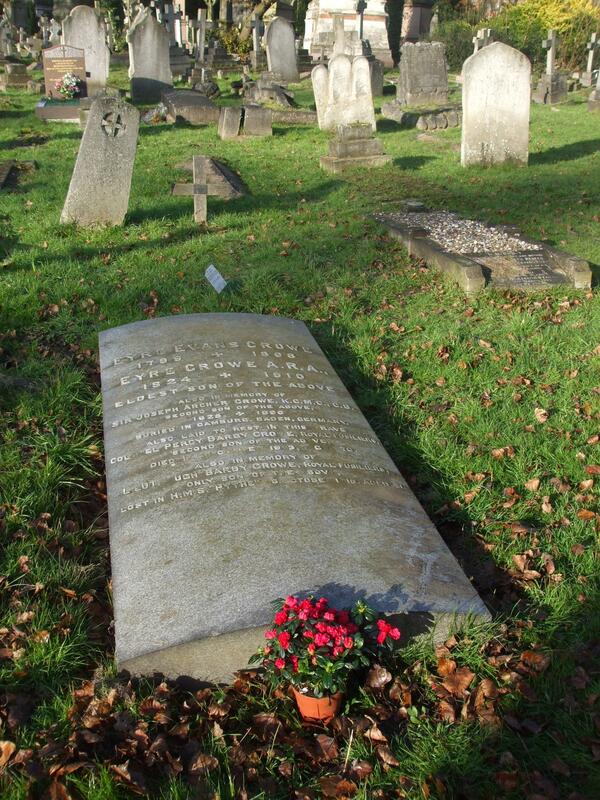 One hundred years ago today, on 12 December 1910, Eyre Crowe died at the age of 86. It seemed to his obituarist in The Times (13 December 1910) that he ‘had long outlived any artistic celebrity that he may once have had’ – that he was a relic of the mid-Victorian age, an artist who had lived so long that he had been virtually forgotten. The journalists who reported his death may indeed have had to look up his achievements. Despite continual participation in the Royal Academy Summer Exhibition every year until 1908, it was true that Crowe’s longevity had not been matched by critical and financial success in his latter years. One hundred years later, it is possible to look back at the full sweep of Crowe’s life and career without prejudice, and to appreciate the artworks created by him, many now regarded as interesting and vivid depictions of prosaic contemporary life, such as slaves waiting to be sold, mill girls on their lunch break, a crush at the theatre door, and men working in an iron foundry. To commemorate Crowe’s life, I left a cheerful plant next to the grave in which he was buried with his father and nephew, at Kensal Green cemetery in west London. This entry was posted on Monday, December 13th, 2010 at 10:38 am and is filed under Biography. You can follow any responses to this entry through the RSS 2.0 feed. You can leave a response, or trackback from your own site.